For farmers across the country, it comes as no surprise to hear that conservation tillage practices – particularly continuous no-till – can save time and money compared to conventional tillage. The potential benefits of no-till are well-documented, from improving soil health to reducing annual fuel and labor investments. Still, continuous no-till has been adopted across only 21 percent of all cultivated cropland acres in the United States. Why? One concern involves money saved compared to money spent. Can fuel and labor reductions really make up for the money invested in switching to a new farming practice? To help farmers answer this question, the Natural Resources Conservation Service (NRCS) Conservation Effects Assessment Project (CEAP) conducted an annual fuel savings study comparing gallons of fuel used in conventional tillage practices to gallons used in conservation tillage practices like seasonal and continuous no-till. We hope the results will help farmers weigh their options when considering adoption of conservation tillage practices. 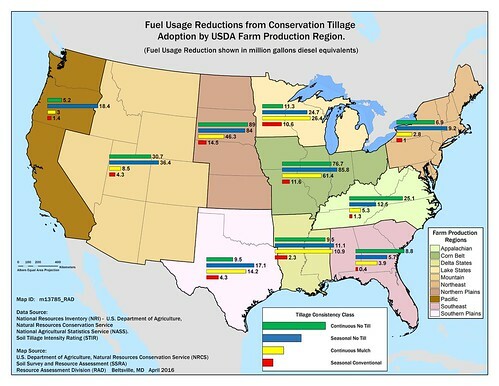 Farmers across the country save fuel and money by adopting conservation tillage practices. Fuel saved is money saved. On average, farmers practicing continuous conventional till use just over six gallons of diesel fuel per acre each year. 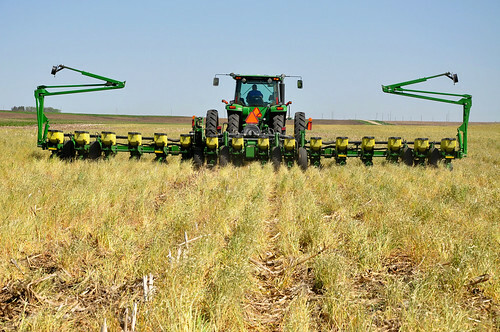 Continuous no-till requires less than two gallons per acre. Across the country, that difference leads to nearly 282 million gallons of diesel fuel saved annually by farmers who practice continuous no-till instead of continuous conventional till. Farmers who manage at least one crop in their rotation without tilling – seasonal no-till – save an additional 306 million gallons of fuel annually. These savings add up for individual farmers. Let’s assume an average off-road diesel fuel price of $2.05 per gallon. If a farmer farming 1,000 acres of crops switches from continuous conventional till to continuous no-till, he or she saves 4,160 gallons of diesel fuel – more than $8,500 worth – each year. Just switching from continuous conventional till to seasonal no-till saves a little more than 3.2 gallons of fuel per acre. Across 1,000 acres, that equals roughly $6,600 worth of fuel saved annually. Saving time and improving soil health lead to additional economic benefits. No-till has significant economic benefits beyond reduced fuel usage. A farmer who plows 15 acres per hour, for instance, would save roughly 67 hours of work with each eliminated pass over a 1,000 acre field by adopting no-till. Depending on labor costs and equipment maintenance, that’s an additional several thousand dollars saved each year. Fields managed using no-till for multiple years generally have a higher water holding capacity than conventionally tilled fields. This is particularly valuable in drought-prone areas, where lack of water is a major concern tied to crop loss. No-till adoption also reduces soil erosion, increases soil biological activity and increases soil organic matter. These benefits can lead to additional economic gains for farmers over time. At the NRCS, we understand that farmers need to care for their bottom line while caring for their land. Visit our website or your local service center for more information about integrating conservation practices like no-till into your management plan. To learn more about CEAP and our commitment to improving conservation strategies across America’s working lands, please visit NRCS’ Conservation Effects Assessment Project page. Hello, Namaste from India. How can I know about no till farming Fertigation? Where could I find the results of use of 'Dynamic Lifter', which is known well in Australia and I hear in U. S.too. A great article using easy math instead of rocket (fuel) science. I think that for bulletins like this to be really useful, a definition of "no-till" is needed. Then it would be helpful to know before planting crops or cover-crop seed which crops do well with "no tillage". I and others that I have talked with have found that for many cover crops, the more tillage, the better the stand. Unfortunately, there's no free lunch. The cost of "no till" is the increased use of herbesides. What would be the cost difference on weed control in no-till compared to conventional till? You might read Dr. David Nielsen's research..USDA Akron CO as well as Dr. John Holman KSU Garden City IS to understand that your claim of no till is the answer for all farmers is unfounded. Please do the literature search before making such claims. I love this article. I think it really does, in the long run, improve the stability of the farmland. Maybe life will be a little easier for farmers if they make the switch. It is a lot of pressure though. This article is short and informative, with some very useful and good information. No till or less tillage equals healthier so mainly because you are building organic matter. Everytime you plow you loose over 2,000 lb. of carbon to the atmosphere in only 24 hours. This is why, over a 100 years of tillage, we went from 8% organic matter to 3-5% organic matter in our fields. Check your records, from soil samples over the years, to be able to see if you have built or remained the same on your organic matter. 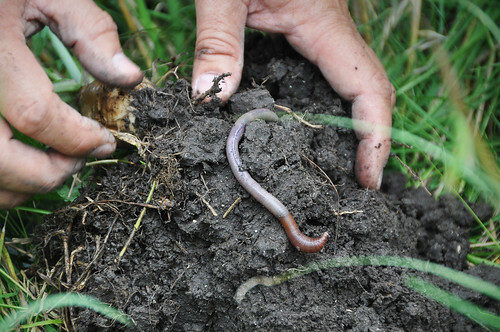 BUILDING YOUR ORGANIC MATTER IS THE KEY TO HEALTH SOIL. If you can't measure it ya can't manage it. I sincerely believe that we all need to understand what the definition of soil health is. I know you have to be able to measure it to get some standards. Soil penetrometer, water infiltration and soil bulk density will tell you a lot. Compare your in field soil to the fence row and now you have your best comparison to what it may have been before we started tilling. While working as the Pheasants Forever Habitat Chair in Colorado for many years, we tried to talk about no till quite a bit. However, the traditional farmers are always skeptical. Coming from an agrarian background with both sides of my family, I saw and experienced year after year, the plowing and fallowing. I always wondered if there was a better way. While hunting pheasants several years ago in South Dakota, was on lands that did the no till farming. They were successful, but they did use lots of chemicals to keep the weeds down. Informative blog. Thanks for sharing. Our soil organic matter, here in Iowa, use to be 7-8%. Now organic matter maybe as low as 1-4%. Tillage is the culprit! Everytime you till farmers loose over 2,000 lb. Of carbon to the atmosphere/ acre. That is reducing the organic matter, reducing water infiltration and 20-29 lb. of free nitrogen/ 1% organic matter is lost. @Robert Wallace - Thank you for the comment. We would be happy to help! The best way to get started is to contact your local NRCS district conservationist. Here is a website to locate a USDA Service Center in your area: offices.sc.egov.usda.gov/locator/app?state=FL. I enjoyed reading the comments and want to include these facts in a handout. Do you have any references to prove these statements: "No till or less tillage equals healthier so mainly because you are building organic matter. Every time you plow you loose over 2,000 lb. of carbon to the atmosphere in only 24 hours. This is why, over a 100 years of tillage, we went from 8% organic matter to 3-5% organic matter in our fields. Check your records, from soil samples over the years, to be able to see if you have built or remained the same on your organic matter. BUILDING YOUR ORGANIC MATTER IS THE KEY TO HEALTH SOIL. If you can't measure it ya can't manage it. " Thanks. I understand holding water by doing no till. But what about the chemicals that are sprayed to kill what is growing in the fields you are planting? Were doe it run off to? And how many times after planting do you spray the crop?